At WeDo Tanks, we design and build custom Golf Course Irrigation Systems. Backed by vast industry experience, we’re able to meet the needs of golf course irrigation systems or irrigation tanks. Be it a completely new install of a borehole or upgrading of a poorly constructed one, we handle everything. At WeDo Tanks, you can get everything water storage tanks, existing irrigation systems and delivery lines. Our team of engineers incorporates ultramodern irrigation tanks that help save costs and ensure they are used to maximize efficiency. Click here to see our press release on Golf Course Irrigation Systems and Concrete Irrigation Tanks for Golf Courses. © 2013 by wedotanks.com® All rights reserved. www.wedotanks.com® Designs and Builds Golf Course Water Storage Tanks and Under Ground Concrete Water Tanks For Golf Courses. Many top golf courses across the country are converting their water irrigation ponds and lagoons to concrete water tanks. Golf course water tanks. As a Leading Designer of Golf Course Irrigation Systems and Golf Course Water Tanks, www.wedotanks.com® Designs and Builds Golf Course Water Storage Tanks For Golf Courses. We manufacture golf course irrigation systems and custom design to meet any specifications. HTI offers extensive experience in golf course irrigation systems and we take pride in minimizing downtime on the course and avoid disruptions, close closures, or safety distractions to your golfers. Our golf course irrigation systems reduce costs and optimize the water irrigation systems of golf courses. Over 30 years of experience with precast concrete construction and irrigation systems have helped make www.wedotanks.com® a leader in the design, construction, and installation of water storage tanks for golf courses. www.wedotanks.com® can design, construct, and install several types and sizes of precast concrete tanks and components for golf course irrigation systems. Precast concrete is construction concrete made with a reusable mold, or “form”, and cured in a controlled environment. The final precast concrete water tank for golf courses are then transported to the golf course site and lifted or fitted into place. All of www.wedotanks.com®’s golf course water tanks and concrete water storage tanks for golf courses are available with precast concrete manufacturing. Precast concrete is an old and well-known concrete construction technique. Even the ancient Romans understood the benefits of precast concrete, using the precast method to build their complex network of aqueducts, culverts, and tunnels – much of which is still standing or in use over 2,000 years later! How’s that for durability?!? At www.wedotanks.com® , we believe in, and stand behind, the durability of our precast concrete tanks and irrigation systems for golf courses. Modern uses for precast concrete include the manufacture of landscaping walls, security walls and urban soundproofing panels. Precast concrete methods are also used to manufacture a wide variety of holding tanks – for fire protection reservoirs, potable water, golf courses, wastewater treatment plants and municipal water systems. For a custom quote on concrete water tanks for golf courses visit our Design A Quote form. We want to stress that the design and the sealant used in our precast concrete tanks is environmentally friendly. Environmental regulatory agencies allow the HTI precast concrete water storage tanks for golf courses to be built for potable water storage. The sealant on all of our precast concrete water tanks for golf courses carries up to a 20 year warranty by the sealant manufacturer. Primarily, www.wedotanks.com® uses precast concrete manufacturing processes to produce golf course water storage tanks and underground irrigation systems for golf courses. Cast In Place Concrete Water Tanks For Golf Courses. www.wedotanks.com® highly recommends the use of precast concrete construction methods, but we are able to perform either precast concrete OR cast in place methods with a high level of quality and expertise. Whether you need precast concrete water tanks for golf courses or golf course irrigation systems, contact www.wedotanks.com® today and let the golf course irrigation system design experts help get your project up and running. 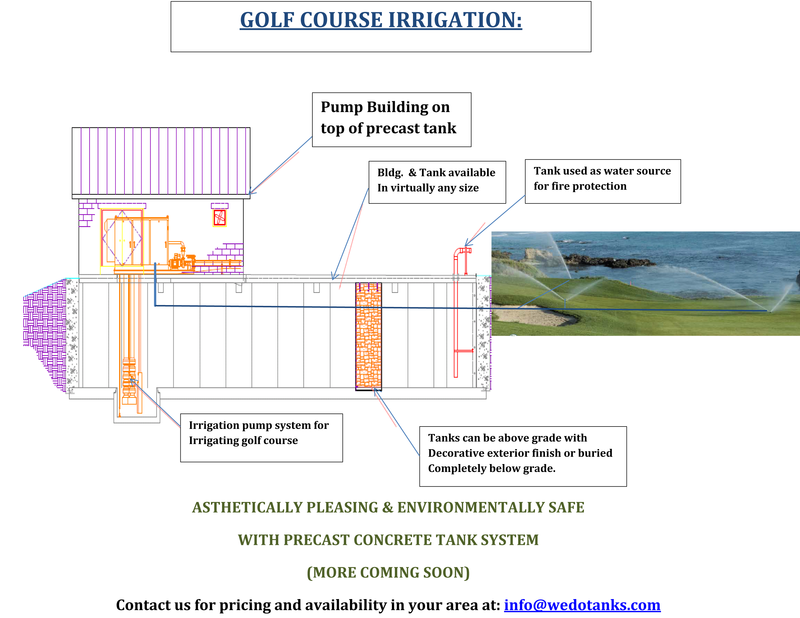 For a quote on custom golf course irrigation systems or golf course water tank visit our Design A Quote form.